Marvel Two-in-One #10 Review – AiPT! The Fantastic Four are back! Except they aren’t. Except they are. Ugh. Johnny Storm and Ben Grimm have regained their powers! Just in time, too, because in Marvel Two-in-One #10, they’ll have to contend with the Spider AND the Mad Thinker’s faux Fantastic Four. Is it good? The evil ruler of this Battleworld, the Spider, is hot on the trail of Grimm and Storm! He never liked that guy, you know! Even if he’s got the wrong guys, he may just kill ’em anyway! With great re-power comes great responsibility, as Ben and Johnny return to free the Mad Thinker’s hostages. Do they know what they’re getting into? Do their enemies? Did Johnny really see what he thinks he saw? Their powers are back, so that surely means Reed and Sue Richards are also, right? Well …. Yes, if you bought the return as depicted in the previous issue, Marvel Two-in-One #10 may have some bad news for you. Or not. Writer Chip Zdarsky leaves the ultimate fate of Reed Richards and Susan Storm (still) unclear, which may feel like a bait-and-switch, especially with the ending of this issue. Fool me once …. The rest of the writing is about on par with #9 — fairly rote with some weird redundancies. The villains actually get some decent characterization, as Zdarsky continues to explore them as mooks just trying to make a buck, but what the heck is up with the Mad Thinker? He’s clearly trending more toward the “mad” part these days, but the “thinking” is almost non-existent, as the great probability analyzer falls for a devastatingly simple ruse. But at least the art is better! Okay, not by a whole lot, but Ramón K. Pérez shows some nice motion in the opening scene and his facial expression are more successful in carrying the narrative than they have been. The Thing analog in Thinker’s FF sure looks ridiculous, though. There’s stylized, then there’s weirdly, unnervingly disproportionate. 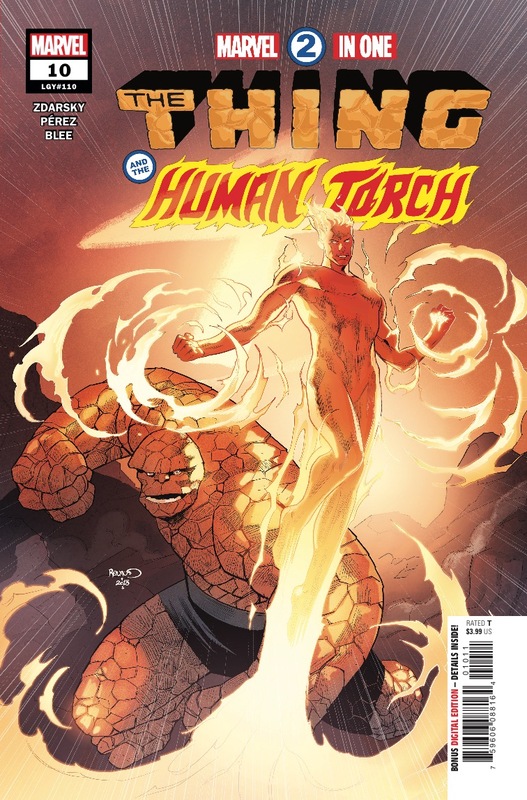 The real star of Marvel Two-in-One #10, if there is one, is colorist Federico Blee, who gets to cut loose now that Human Johnny is Torchified again, pitting his warm hues against the cold ones of Goodfire. And he really nails the “invisible” effect in the panels that include Susan, evoking her powers but also creating a dreamlike appearance that makes the reader question whether the events actually occurred or not. Marvel Two-in-One #10 is a step up from the disappointing previous issue, but it’s far from the heights Zdarsky’s love letter to the Fantastic Four had achieved. There’s some nice teamwork between Johnny and Ben, but the Torch makes some weird decisions (even for him) and the story is left in almost exactly the same place as it started by issue’s end. It’s hard not to think this book was extended past its initial run due to the deserved buzz it garnered, but the overall story probably would have benefited if it had been capped earlier, without this filler-like material at the end. It's a step up from the previous issue, but the redundancies and rote storytelling are still disappointing when you consider how greatly this series started out.